Join the happy mushroom for a life of happiness at the enchanted forest, a place where mushrooms lives freely alongside bunnies, ladybirds, and wise owls. And they all like to play Easy Slots! This mushroom is not for consumption but is more than happy to help you win some treasure and slots bonus. Eyecon has been in the lead of the online casino industry, with their top-quality slot games, aiming to satisfy any type of interest through a diverse portfolio built over 20 years. They guarantee an enjoyable slots experience and dedicate themselves to bringing you entertainment and high chances of multiplying your winnings. 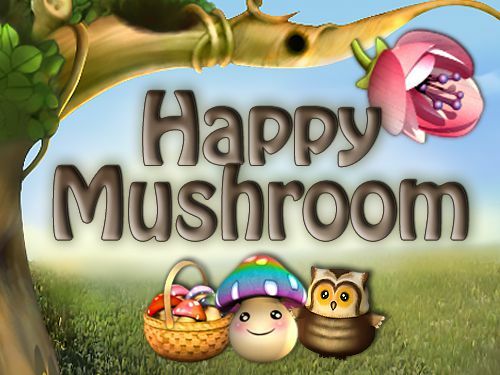 Happy Mushroom is one of their more uplifting games, combining cute symbols from nature with cheeriness. Why is the mushroom happy, you ask? Because it likes seeing you collect baskets of coins. Play now and you’ll start smiling too! If you like Eyecon games then check out the full suite at EasySlots.com. Happy Mushroom delivers exactly what it promises: a happy slots experience. There’s nothing more relaxing and uplifting for your mood than a walk through the forest, admiring the creatures who live there and the plans that grow, especially in the warm season. What if it’s a magical forest, where mushroom smile at you and you find little houses among grass, were little insects go about their daily business? Oh, and they’re offering you coins as well, just for visiting them. Then you’ve got a reason to be happy too, just the like mushroom. Take advantage of this fantasy world, and start winning! With 5 reels and an adjustable number of paylines, going up to 25, this slots game offers you big Bonuses and wins, as long as you’re curious and imaginative. The adorable graphics will bring you joy even before playing- a happiness-filled little mushroom village opens its gates for you and butterflies, snails and ladybugs come to join. You can start your bet from as little as 0.01 and go up to 0.50, while the gamble option is always available, should you want to try and catch more happiness. In a slots game such as Happy Mushroom, you’d expect to find cute and smiling symbols, and that’s exactly what you get: friendly hooting owls, charming flowers, blushing bunnies- you couldn’t imagine anything more adorable! And they’re full of rewards, too. The Mushroom and the Owl, he most prominent characters, are both Scatters. 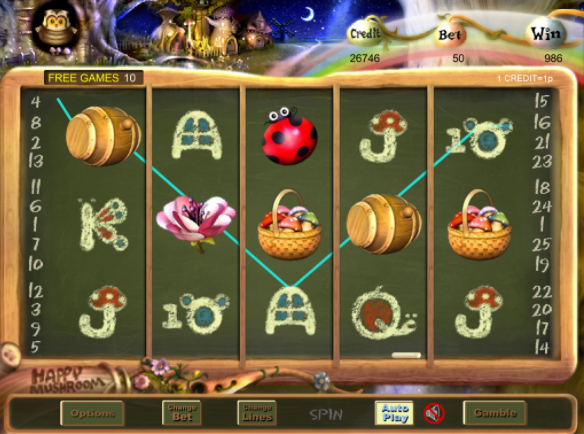 Spinning 3 Mushrooms bring you a fun Mushroom Adventure Bonus- you get to choose 3 favourite mushrooms out of 5 and can win up to 100x the initial bet. Owls, on the other hand, bring you up to 25 free games AND multiply you bet by up to 100x, if you spin 3 or more of them. Even if you spin 2 owls, they work together to double your bet. Those are some generous creatures! more slots bonus when you start playing today! And don’t forget the beautiful pink flower, as that’s the Wild symbol and will replace any other symbol, except for the scatters, to bring you winning lines, while also doubling your prize. Happy Mushroom is a simple and straight-forward slots game, that brings you happiness with its adorable graphics. If you’re ever feeling down, this mushroom will be your friend and cheer you up with coins. This slots experience has one of the nicest themes that Eyecon offers and plenty opportunities for you to win big. There’s no doubt that it’s worth taking at least a short walk through this fantastical forest. Want another amazing game to try? join & spin here.